The original bridge in Minneapolis carrying I-35W across the Mississippi collapsed in 2007. The root cause of the bridge failure was a design error: a pair of steel gusset plates were specified to be half as thick as the load required. The forces involved are impressive, in the tens of thousands of pounds per square inch. 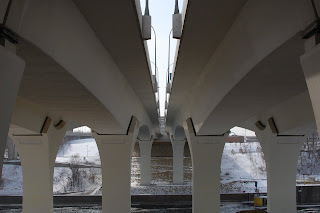 This is the underside of the Saint Anthony Falls Bridge that was erected as its replacement. Design and construction was completed in just over a year.